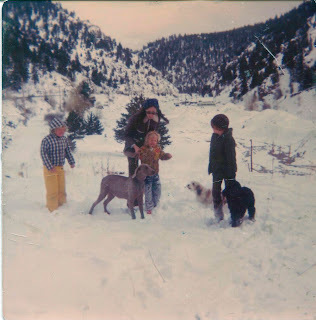 Since we’re talking about things we love- or maybe don’t love- this month, it seems like a good time to reminisce about my life-long love od snow. 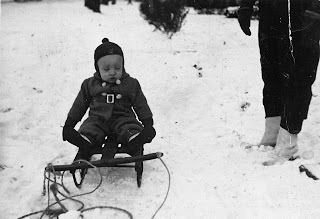 This is my older brother, the winter I was born. Too bad no one photographed the time about two years later when he dragged me through the snow in a cardboard box, oblivious of my screams. The cardboard had worn through and so had my snowsuit. But I soon forgot it. I was a lways the one who wouldn’t come in even when my nose looked like Rudolph. In my early teens, I learned to ice skate, and in winter, my brother and I spent many a night in the moonlight skating on the town reservoir. I really missed ice skating when we moved to Oklahoma. Not that winters aren’t cold or snowy there. But the weather is, well, less predictable. This is April Fools Day, 1969. A foot of snow. In Colorado, we saw a winter with snow o n the ground all but 15 days. We loved to go into the mountains for even more of the stuff. Left to right, the kids are Lori, 7, Jeannie, 4 and Andy, 9. The dogs are Lily, mutt Muttsy, and Jack. 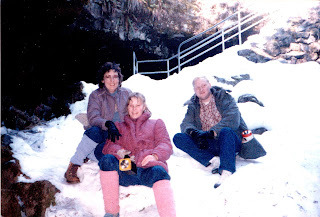 Here’s a grown-up Jeannie, Andy and me (not sure I grew up) in the Ape Cav es on Mt St Helens in winter. We had to slide down those stairs behind us to get in, and getting out was interesting. One of my favorite homes was on Horseshoe Lake in Woodland, WA. 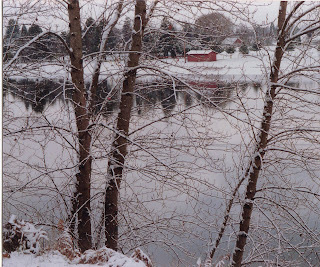 The view over the lake made both winter and summer special. 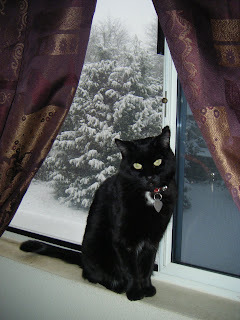 Our dogs may have loved the snow, but our cats didn’t necessarily agree. Alright, none of them did. 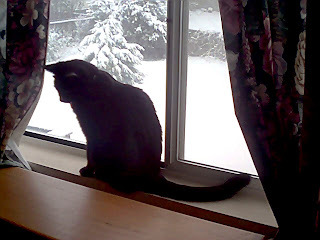 Jinx’s first winter, New Years Day 2001. She thought her world had died. 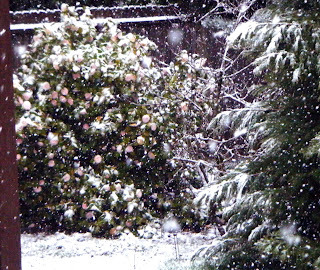 Camellias blooming in the snow, March 28, 2008. Jinx had no interest in blooming camellias. Nope, still doesn’t. Today, same window. The tree outside is more than twice as tall, but that’s about all that’s changed. In fact I couldn’t even get her into the window until I bribed her with kitty treats. But once she saw the value of posing, I couldn’t get her out of the window. Love the pics, particularly of Jinx. I must admit that I’ve never been in love with snow. I do like to visit it in the mountains on occasion. Or having a single day where it’s beautiful I don’t have to go outside is nice. But all this past week in downtown Portland? Not so much. I moved down from Mt. Hood to the city so I wouldn’t have to commute in this stuff. Ah well, I’m glad someone loves it. Thanks, Maggie. 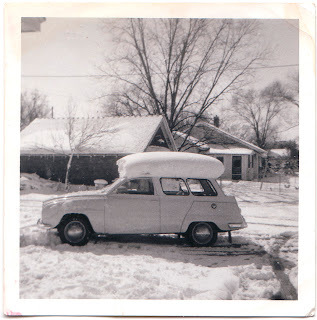 You notice I’m not the one driving these days, although I did learn early how to drive on ice and snow, and never really feared it. And these days, I enjoy it more from the window than out crunching as I walk. 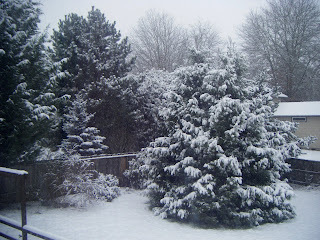 Right now we have 6 more inches than this afternoon when I took that last photo. I doubt if we’ll go anywhere tomorrow. And we’re prepared if the electricity goes out. I love the snow, but don’t like the cold! Yeah, I know, can’t have one without the other. 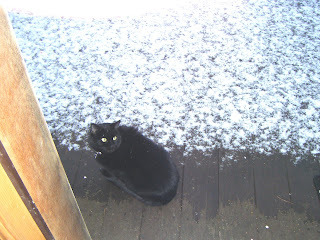 And I really dislike the ice–we’ve had freezing rain off and on since late last night. So I’m not going anywhere right now! It sure is pretty though! I most appreciate snow when it’s out of my area — about a thousand miles away is okay. Otherwise? Nice to look at, pretty to behold, get suckered in, you’re too darn cold!